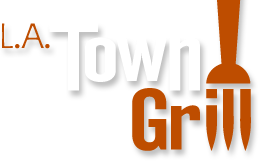 Nestled in a quiet corner of Urban Selections Plaza, L.A. Town Grill is the perfect place to meet with friends, gather with family, or enjoy a romantic night out. Our casually upscale atmosphere, friendly waitstaff, and small town charm will lure you in, but our food will keep you here. Generous portions made with only the freshest ingredients at reasonable prices are the perfect recipe for any discerning guest. Offering an ever-evolving and extensive menu, including both senior and children’s selections, we are sure to have something for everyone. We welcome you to come in and try one of our daily homemade soups, perfectly battered halibut and chips, savoury crepes, or succulent steaks. Try us once and we're sure you'll be back again! Open 7 days a week for breakfast, lunch and dinner.